I am hoping some heater experts can help me out here..
My H400fdn Hayward Heater will not turn on with the Omnilogic remote. This heater is less than 3 years old and was installed with my pool by certified professionals. If I take the heater out of bypass mode I can run it manually without issues. I am using the 2 wire remote from the OmniLogic control to the heater wiring block. I am getting voltage from the omnilogic to the wiring block and the same voltage from the wiring block to the heater control board plug (E1). I saw 0.2mv when running on, negative millivolts when turned off. And I think I saw a jump to 25v or something on the voltmeter when omnilogic went to switch the heater from off to on, I don't remember at this point. But it seems to be at least getting the signal to the controller board.) Could this be an issue with the controller board on the heater? Not sure what the proper voltage should be to the heater. Maybe it's something with the Omnilogic controller? But everything else seems to work fine through the Omnilogic setup. Any help on next steps would be appreciated. Don't want to point out the obvious, but are you sure the heater is still enabled in the OmniLogic configuration menu? Not sure what you mean by "enabled". In the config it has the heater tied to the correct relay. Same as for the pool. Does the front of your heater say, "bO"? 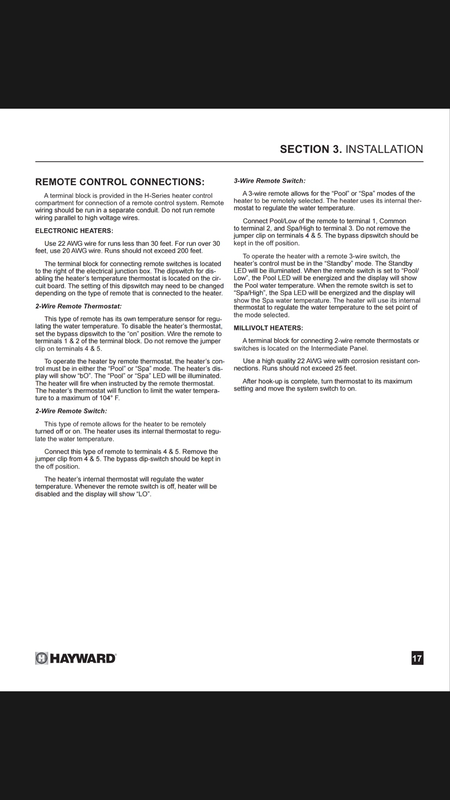 Here's the instructions for setting up the heater to work off the Hayward thermostat and controller. Oh - after rereading saw you took it out if bypass mode and it worked. It does say bo...if I take it out of bo mode I can start the heater from the heaters control panel. Hmmm - unfortunately, that's all I have. Did you unplug it and plug it back in? Haha that seems to fix a majority of my electronic problems. Here is the manual for the FD heater. Page 31 talks about connecting it to the remote wiring. Also, check to make sure the wire between the heater and the controller is good. Check it for continuity. Did you find a solution to this problem? I am having the same issue.